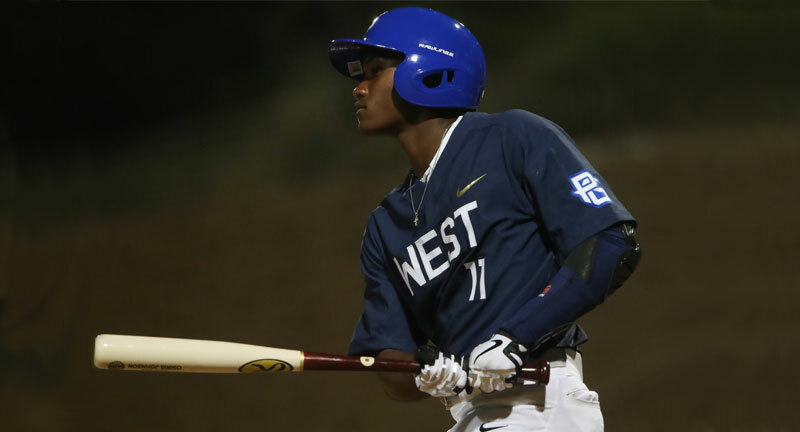 SAN DIEGO – It didn’t matter where Northern California shortstop Osiris Johnson found himself during the first two full days of events at this week’s Perfect Game All-American Classic there were a couple of other things that were easy to find in his very close proximity: an easy smile and a ready round of laughter. If it seemed as if Johnson was acting like a kid at a candy store regardless of where he was – Rady Children’s Hospital, Trevor Hoffman’s Pacific Ocean beach house, the University of San Diego’s Fowler Park or the San Diego Mission Valley Marriott hotel – it can be both easily excused and explained. In comparison to his teammates on the PGAAC West Team and his opponents on the East Team, Johnson really is the new kid on the block. And, perhaps, like no one else on either roster, he seems to be taking it all in with an especially youthful zeal. “I’m really having a lot of fun; I like playing with all these new kids,” Johnson told PG Friday night during the Team Practice Session at Fowler Park. “I played with some of them previously this summer, but out here on the big stage we’re all really having a lot of fun. At 16 years, 9 months-old, Johnson is the youngest prospect playing in this year’s PGAAC. He sometimes thinks that he might have benefitted by being held back one year and being a 2019 instead of a 2018, but it isn’t anything he dwells on. And, besides, he’s being playing up an age-group for as long as he can remember – he was playing with 13-year-olds when he was 11 – and his talents have always blended-in seamlessly with those of the older players; none of his actions betrayed his young age. The PG All-American Classic is an entirely different slice of pie when it comes to one prospect comparing his talents with the guy sitting across the diamond or sitting across the dinner table. These guys are the best-of-the best from the class of 2018 and while Johnson won’t celebrate his 17th birthday for another three months, many of the other prospects are already 18. So, what’s a young dude to do? How about square your shoulders, stiffen your lip and take a good look around at the talent you’re surrounded by. The Classic weekend is presenting Johnson with a baseball classroom the likes of which he’s never seen and he’s intent to make the most of it. He will be a young senior this fall at Encinal High School in Alameda, Calif., one of six prospects from the Golden State on the West Team roster. But other West players come from Illinois, Indiana, Iowa, Mississippi, Ohio and Wisconsin, to name but a few, and the East roster includes Floridians, Georgians and Puerto Ricans among others. Johnson’s father, Marcel Johnson, was a 22nd-round selection of the New York Mets in the 1989 June Amateur Draft, and played three seasons (1989-90, ’92) in the minor leagues. “That’s my guy,” Johnson said of his dad. “That’s my trainer, my hitting coach, my strength coach, my speed coach; it wasn’t for him I wouldn’t be standing here talking to (PG) right now. He got me started with the game and he’s been with me right up until today. There are more branches on this family tree. One of Johnson’s second cousins is Tony Tarasco, a 15th-round pick of the Atlanta Braves in 1988 who enjoyed eight seasons playing in the big leagues. And another second cousin is three-time MLB All-Star, four-time Rawlings Gold Glove Award winner and 2007 National League MVP Jimmy Rollins, a second-round pick of the Philadelphia Phillies in 1996, right out of the same Encinal High School that Johnson attends; he enjoyed 17 major league seasons and accumulated 2,455 hits. Johnson is listed at 6-foot-1, 187 pounds, and first got involved with Rob Bruno and NorCal Baseball at a fairly you age and made his Perfect Game tournament debut at the 2015 15u PG World Series in Emerson, Ga.
A Cal State Fullerton commit, Johnson said he first watched the Classic on television three years ago and he remembers telling himself that he was going to be playing in the game one day. He, of course, had no idea that invitation would arrive right on time. His exposure in front of PG’s scouting department had been limited over the past two or three years, but that changed when he arrived at jetBlue Park in Fort Myers, Fla., in mid-June to perform at the PG National Showcase. He shined at the event, posting a perfect 10.0 PG Grade and earning Top Prospect List recognition and his invitation to the PG All-American Classic while watching his national prospect ranking climb to No. 35 overall. Johnson started to get attention from college coaches and recruiters after his sophomore season and then last fall went and played in a tournament at Cal State Fullerton, where he showed very well for himself. He caught the eye of head coach Rick Vanderhook who took Johnson into his office and made him an offer. Initially, Johnson told Vanderhook that he was going to wait for a while before making a decision, but ultimately decided that was the best place for him after all. The 2018 MLB June Amateur Draft may have something to say about whether Johnson ever makes it to the Fullerton campus or not, but that is something to consider at a later date. In the here and now, Johnson – the kid that has always played up – will continue to learn from all of his real-life experiences, like those he’s getting in San Diego this weekend. Just about every young man that has been invited to be a part of the PG All-American Classic weekend cites the visit to Rady Children’s Hospital at the highlight; Kid Johnson was no exception. And when Johnson returns to the Bay Area Monday morning, he knows exactly what sort of intangibles he wants to pack in his equipment bag to take home with him. They’re the kind of things every player wants to take away from an all-star event of this nature, but it should come as no surprise that with Johnson it revolves around the simple joy of learning and loving the game.